Woodworking in the garage has many challenges, space and lack of airflow are two at the top of my list. Another is cleanup. There’s not too much that can be done about space, and I’m stuck with the airflow situation. But cleanup is something that I’m finally getting under control. For example, all the large power tools are mobile, as is the workbench and tool storage. That allows for the garage floor to be swept from one end to the other. 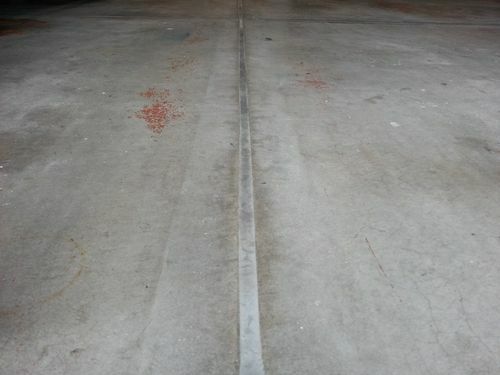 The floor is divided into four sections due the expansion joints, so although not the worst of problems, it is annoying when the debris gets into the cracks. So usually each section swept individually. Not a huge deal, been doing it for a very long time, but it is an annoyance. One day at work, I noticed the maintenance department using Sikaflex self-leveling sealant on the expansion joints on the shop floor area of a new building we recently acquired. They used quite a lot, since it’s a 30k ft. space, but it installed easily enough and the cost is not unreasonable. I thought I would give it try. Home Depot has the product in two sizes and two colors. A couple large tubes and one small tube of the grey was needed to complete the floor in this two car garage. The installation was simple, as previously mentioned, but there are a couple precautions. First, make sure the joints are completely cleaned out. A screwdriver and vacuum were used, the driver needed to dislodge dirt and old sawdust that was stuck deep down where the broom was not reaching. And although this product comes in a tube that looks like caulk, it’s not. 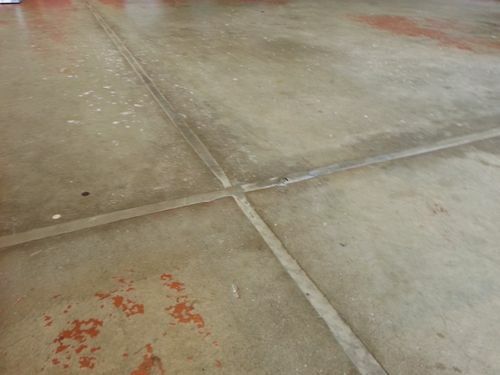 It comes out much runnier, more like syrup, which is necessary for the self-leveling to work. Fast-forward a few months: It does indeed make sweeping out the garage much easier and a bonus is that the mobile tools and workbench roll around easier too. Here are a couple “after” shot, the cars tires and tools seem to have no effect at all. We’ll see what a winter of snow, water and salt do to it. Looks good, Hope you have good luck with it! They have been around a long time and make a good product. Good idea. I have the same problem in my garage shop, so I might follow suit. Looks very good, I had never heard of this product, thanks for the heads up. This IS good stuff! Back in 2007 I finally got to the point that I had to make a decision – Was I going to have a shop in the garage? or was I going to have cars in the garage? Cars are built to sit in the weather and tablesaws are not so the Car and the Pickup lost. I painted the floor with Epoxy paint and sealed the cracks or grooves with this stuff and after 6 years it is still just as flexible and nice as the day i laid it in there. It has performed well and I would not hesitate to use it again. I do occasionally muscle things out of the way and bring the car in for maintenance if the job is large enough and calls for indoor work but even then it has stood up well to the chemicals and abuse car maintenance can inflict. More than one person has asked my why I park my vehicles outside when I have such a nice garage. I just smile and leave them guessing. We use a lot of Sika products where I work. Good stuff. Thanks for the review. My shop now has the expansion joints filled with this stuff. It looks great and no more sawdust and shavings in the expansion joints. Nice! And it was pretty easy to install too, right? Just had to get used to how runny it is. Reading this review tells me how I’ll fix this issue in my garage. Thanks! I’ve been looking for something that would make it easier to move my tools across the expansion joints. Thanks for sharing. I’m glad you wrote the review. I’ve been looking for something to fill the gaps in my concrete. After reading your review I read several other reviews on across the internet. Since my floor has a slope to it I chose to use quickcrete brand since it isn’t supposed to be as runny. I put it down yesterday and worked pretty well except the foam backer rod lifted in some areas. Did you have this problem? There is no foam backer, just squeeze the stuff into the crack. How much of a slope? Not sure of the slope. Other reviews I read said if there was any slope the stuff would run. The foam backer is supposed to be used such that the pour depth is no more than 1/4”. Mine was 3/4 deep so I put the round foam rod in and it worked in most places but surfaced in others. And the foam is much cheaper than the sealant. I ended up cutting the foam that was higher than the surface and pouring more sealant. After I finished I left the house and wont know what it looks like until Monday. Good post, never had an issue to deal with like this but I do have a few friends that have asked about what to do so I will pass this on. @woodbutcherbynight: Since my shop is an attached garage that is used to enter the house (into the kitchen), having sawdust tracked in the house does not go over too well. So, it’s a necessity.. plus I would rather have a clean shop.